Nearly thirty years since it was first produced at the National Theatre, Alan Bennett’s stage adaptation of Kenneth Grahame’s beloved The Wind in the Willows has become a classic in its own right. Bennett’s trademark wry humour reshapes the adventures of Mole, Ratty, Badger and Toad into a witty, warm-hearted tale for young and old. Shamelessly rose-tinted and misty-eyed, this is a delightful romp through a charming Edwardian England that is sure to warm your heart despite the snow! People’s Theatre are no strangers to Alan Bennett’s work here having staged his hits including ‘The Lady In The Van’, ‘The History Boys’, ‘Habeas Corpus’ and ‘Talking Heads’ to much acclaim in previous years. Bennett, now 83, is showing no signs of slowing down and his new play ‘Allelujah!’ was recently announced, to be directed by Nicholas Hytner. It will be the pair’s tenth collaboration, the first being The Wind In The Willows in 1990. As well as what goes on inside our theatre giving us something to shout about, the building itself is also turning heads! The redevelopment has seen the theatre shortlisted for the 2018 RICS Awards North East, an annual event which celebrates building projects across the region. They are delighted to be recognised alongside buildings including The Sill National Landscape Discovery Centre, Hexham and Newcastle’s Tree Top Village in the ‘Community Benefit’ category. The winners will be announced in April. 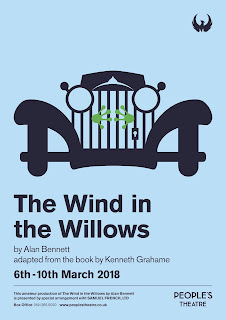 The Wind in the Willows will be performed from Tuesday 6 to Saturday 10 March at 7.30pm. Tickets cost £14 (Concessions £11.50) and are available from the box office: 0191 265 5020 or online at www.peoplestheatre.co.uk.